SPECIAL NOTE: Candidates that are willing to commit to working a year at Mount Rainier Pool, can take the class for FREE! Please contact Kaitlyn at (206) 773-9683 to register. 300 Yard Swim: Swim 300 yards continuously demonstrating breath control and rhythmic breathing. Candidates may swim using the front crawl, breaststroke, or a combination of both, but swimming on the back or side is not allowed. Swim goggles may be used. Tread Water: Tread water for 2 minutes using only the legs. Candidates must place their hands under the armpits and keep their head above water. Timed Event: Starting in the water, swim 20 yards using front crawl or breaststroke, surface dive 12 feet, retrieve a 10-pound brick, return to the surface, swim 20 yards on the back to return to the starting point with both hands on the brick and exit the water without using a ladder or steps. Must be completed within 1 minute and 40 seconds. Swim goggles are not allowed. Candidates should not swim the return distance underwater. Please bring a swimsuit and towel for the skills evaluation on the first day and for every class. 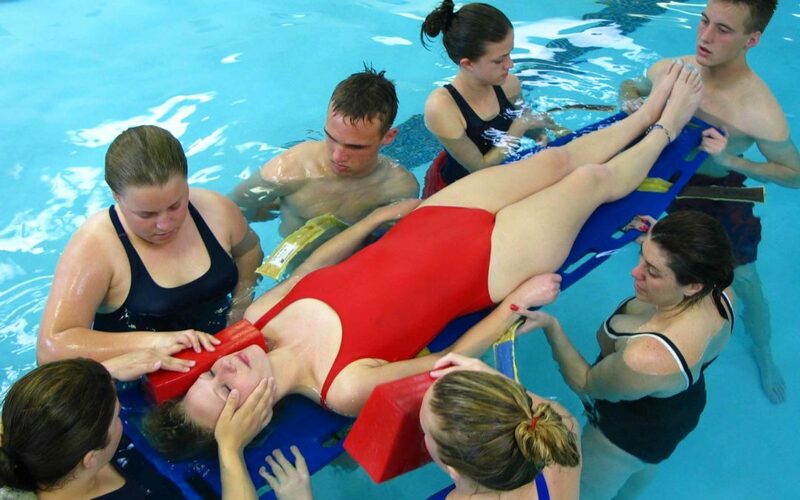 The American Red Cross Lifeguarding course teaches candidates the knowledge and skills needed to prevent and respond to aquatic emergencies. The course content and activities prepare candidates to recognize and respond quickly and effectively to emergencies and prevent drownings and injuries. You will need to attend June 22ND date in order to take the class. Please bring a swimsuit and towel on the first day and for every class. If there are any questions regarding this course, please contact (206)824-4722 .